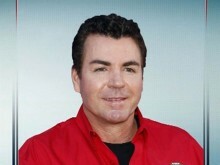 In 1983, John Schnatter delivered his last campus pizza, picked up his business degree from Ball State University, and went home to Jeffersonville, Indiana.There, at age 22, he knocked down the broom closet in his father’s tavern, installed an oven and began delivering pizza out of the back of the bar. From day one, John believed he could make a better traditional pizza by using fresh dough and superior-quality ingredients. Today, Papa John’s boasts 3,054 restaurants in 50 states and 32 countries. Papa John’s remains focused on using the highest quality ingredients to make its customers a superior-quality pizza. In 1996, Schnatter and his company earned the praise of residents in their hometown of Louisville, Kentucky, by making a substantial funding commitment for a new 42,000-seat football stadium on the University of Louisville campus. The structure, which opened in September 1998, is called Papa John’s Cardinal Stadium. Schnatter’s numerous business achievements and philanthropic efforts culminated in his induction into the Junior Achievement U.S. Business Hall of Fame in 2007. He was also named one of the Ten Outstanding Young Americans in 2000 by the National Jaycees Organization and the 1998 National Ernst & Young Retail/Consumer Entrepreneur of The Year. Do you want to hire John Schnatter? Directly request a quote. In 48 hours we can send you the availability of John Schnatter If you would like to book John Schnatter, Entertainment Booking Agency is the right place. We will offer you the best price and contact the management or we directly contact John Schnatter. For corporate appearances or speaking engagements you can contact our agents and the will help you true the process. Tags: hire John Schnatter, John Schnatter booking, book John Schnatter, John Schnatter appearances, find more information on booking John Schnatter for appearances, John Schnatter speaking engagements, John Schnatter endorsements/spokesperson, John Schnatter appearance fees, John Schnatter booking agency contact info, biography of John Schnatter, Contact an artist booking talent agent find a speakers bureau that can book John Schnatter, speaker booking agency for John Schnatter, John Schnatter booking agency, John Schnatter booking for corporate event. EBA is one of the biggest entertainment booking agencies in the World. We book hundreds of celebrities, artist, athletes and speakers in a year. Important to know is that we are not claiming to be the management of John Schnatter. We are not the official agent for John Schnatter. Companies from around the globe book these artists and speakers true our company be course we have one of the biggest networks and we always have direct contact with the artist or the management. We help you to find the right celebrities for your corporate of private events. Please contact one of our agents to get free advice and we will help to get the world-famous artist on your party.